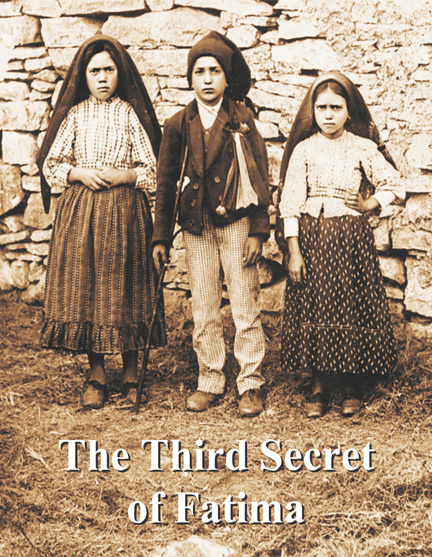 The Three Secrets of Fatima consist of a series of apocalyptic visions and prophecies have been given to three young Portuguese shepherds. 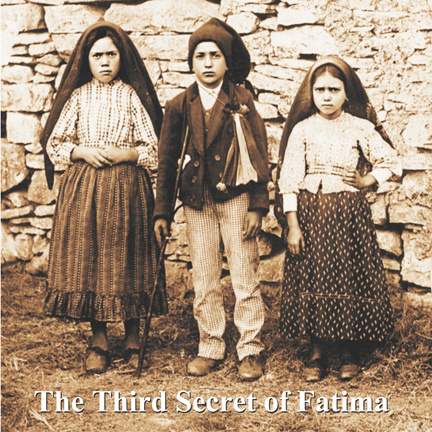 Full Text of the Third Secret of Fatima not revealed? Missing part revealed. "As I told you, if men do not repent and better themselves, the Father will inflict a terrible punishment on all humanity. It will be a punishment greater than the deluge, such as one will never have seen before. Fire will fall from the sky and will wipe out a great part of humanity, the good as well as the bad, sparing neither priests nor faithful. The survivors will find themselves so desolate that they will envy the dead. The only arms which will remain for you will be the Rosary and the Sign left by my Son. Each day, recite the prayers of the Rosary. With the Rosary, pray for the Pope, the bishops and the priests. The work of the devil will infiltrate even into the Church in such a way that one will see cardinals opposing cardinals, and bishops against other bishops. The priests who venerate me will be scorned and opposed by their Confreres. The Church and altars will be vandalized. The Church will be full of those who accept compromises and the demon will press many priests and consecrated souls to leave the service of the Lord. DVD Narrated by Rafael Brom with background music from "The Sounds of Heaven". Audio CD - Narrated by Rafael Brom with background music from "The Sounds of Heaven"
3 - Knowing this first, that in the last days there shall come deceitful scoffers, walking after their own lusts. 4 - Saying: Where is his promise or his coming? for since the time that the fathers slept, all things continue as they were from the beginning of the creation. 5 - For this they are wilfully ignorant of, that the heavens were before, and the earth out of water, and through water, consisting by the word of God. 6 - Whereby the world that then was, being overflowed with water, perished. 7 - But the heavens and the earth which are now, by the same word are kept in store, reserved unto fire against the day of judgment and perdition of the ungodly men. 8 - But of this one thing be not ignorant, my beloved, that one day with the Lord is as a thousand years, and a thousand years as one day. 9 - The Lord delayeth not his promise, as some imagine, but dealeth patiently for your sake, not willing that any should perish, but that all should return to penance. 10 - But the day of the Lord shall come as a thief, in which the heavens shall pass away with great violence, and the elements shall be melted with heat, and the earth and the works which are in it, shall be burnt up. 11 - Seeing then that all these things are to be dissolved, what manner of people ought you to be in holy conversation and godliness? 12 - Looking for and hasting unto the coming of the day of the Lord, by which the heavens being on fire shall be dissolved, and the elements shall melt with the burning heat? whoever does not confess the testimony of the cross is of the devil; and whoever perverts the sayings of the Lord for his own desires, and says that there is neither resurrection nor judgment, such a one is the firstborn of Satan" (Letter to the Philadelphians 7:1 [A.D. 135]). "Whole time of your faith will not profit you unless you are made complete in the last time. For in the last days false prophets and corrupters shall be multiplied, and sheep shall be turned into wolves . . . and then shall the deceiver of the world appear, pretending to be the Son of God, and [he] shall do signs and wonders, and the earth shall be delivered into his hands" (Didache16:3-4 [A.D. 70]).